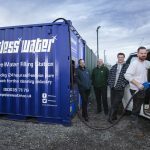 Pure water supplier turns on the taps for first time in Wales | News by Wales Express News, People Before Profit! 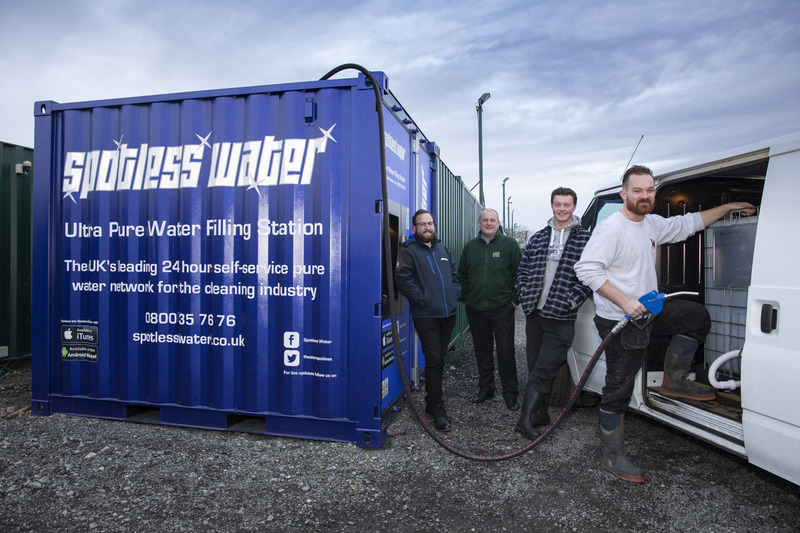 A pure water supplier for window cleaners, car valeting businesses and even tropical fish owners has launched its first service in Wales on a Saltney storage park. 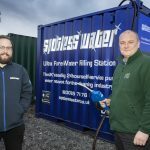 Lock Stock Self-Storage’s River Lane site hosts the big, blue box that weighs 12 tons and contains 10,000 litres of pure water which it dispenses through a self-service system similar to a petrol pump. 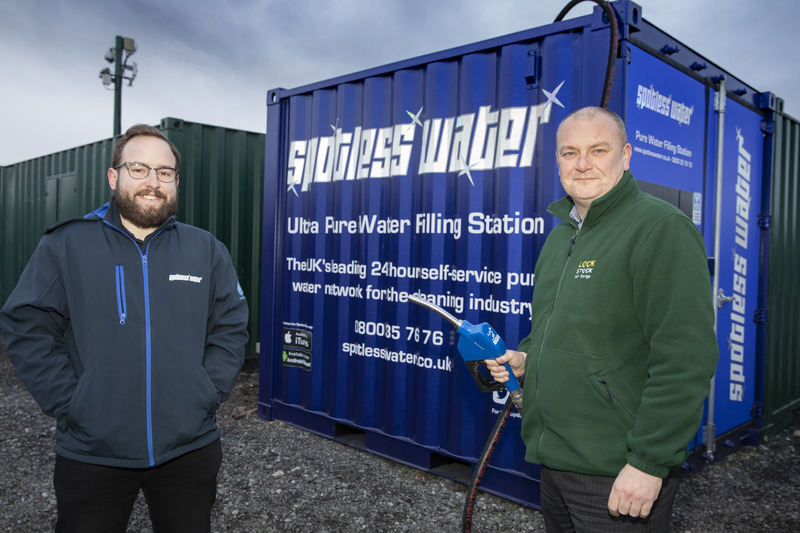 Spotless Water, based in Basingstoke, Hampshire, is the company behind the venture and the Saltney filling station is the first of three to be installed on Lock Stock sites with Shrewsbury and Wrexham due to go on line soon. The pure water concept is the brainchild of Spotless Water Managing Director Tim Morris and arose out of his own window-cleaning and car-valeting business because pure water means no streaks on glass. It has taken off spectacularly with an unexpected demand also coming from people who keep tropical fish which find British tap water a less than ideal environment. The valeting service benefited from the pure water which made it 27 per cent more efficient but keeping them topped up was a problem. He combined the concept of self-service petrol stations to pure water and spent two years developing an eight foot by ten foot container that will purify mains water to provide a continuous supply allied to a card and screen system for payment with customers given account cards and key fobs to access the sites and service. Spotless Water currently have 30 sites operational but plan to roll out to 450 locations over the next three years and storage parks with their secure premises with 24-hour access allied to water and electrical supplies have proved ideal and Lock Stock’s sites fit the bill perfectly. Lock Stock Regional Manager Jeff Woods said: “It’s been a big hit locally because window cleaners can come in and refill the tanks in their vans as often as they need to in the knowledge there is a constant uninterrupted supply here. “It’s brilliant for car valet services as well and for pet shops and aquariums that keep tropical fish. Window cleaners start arriving early at Saltney and Peter Furnival, of Penyffordd, near Mold, said: “One of my customers told me about it and while I make my own pure water at home this means I can stock up when I’m out on my rounds and carry on cleaning. Captions: Lockstock-1 and 2 Lockstock, Spotless water filling station; Pictured (L/R) Darren Minton, Spotless Water Sales Manager; Jeff Woods, Lock Stock; and window cleaners Ellis Forbes and Dan Carolan. 20190118-Lockstock-10: Penyffordd window cleaner Peter Furnival fills up with pure water watched by Lock Stock Regional Manager Jeff Woods and Darren Minton of Spotless Water.